UPDATE: I am restarting this challenge this month (November) because I have not committed to it well. It is a perpetual challenge, but I still need to commit to it! I must be on a challenge kick because earlier on Wednesday I joined my first challenge ever, the RIP Challenge. Well, I was over at the bloggers group on Library Thing and I came across this challenge being hosted by Melissa at Coffee, Books, and Laundry. 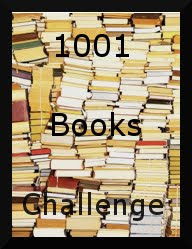 The 1001 Books You Must Read Before You Die list is pretty daunting, but I consider that since reading is so very important to me, then this is the challenge that should be ongoing in my life. So I accept this challenge with gusto and maybe just a little apprehension (take a look at the list here and you'll see what I mean). Must read 1 book a month from the list. Must rotate lists every month. The beauty of this is that I am already reading Frankenstein for my B & N book club and for the RIP Challenge and it's number 931 on the list! If you decide to accept the challenge, be sure to go over to Melissa's blog (link above) and leave a comment. She doesn't really have an "official" sign up, but I'm sure she will be interested in everyone else's progress. I know I will! WOW! Good Luck! Happy Reading! I started that challenge and was failing miserably. I didn't want to read so many of the books! I did the filling in the gaps challenge instead. Good luck. That's one daunting list! I'm just going to plug away...one a month. I was looking over the list and I already own a lot of the ones that are listed and then there are a lot on there that I've never even heard of...lol! There are a few I have no interest in reading and then there are a couple that I have read and didn't like (Confederacy of Dunces, The Black Dahlia). It's rare for me not to like a book, but when I do, it's serious =) Thanks for the well wishes...guess I don't have any takers yet, huh?